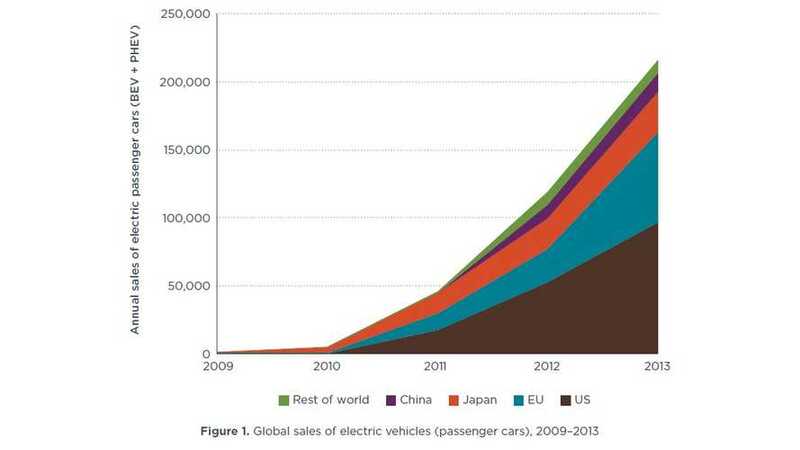 The International Council on Clean Transportation (ICCT) recently released a report titled "Driving electrification: A global comparison of fiscal policy for electric vehicles" on fiscal incentives that governments in major vehicle markets worldwide have deployed to promote plug-in electric vehicles. ICCT presented the situation in 11 markets, finding that tax exemptions and subsidies are playing a key role in spurring electric vehicle sales, but in widely divergent ways. 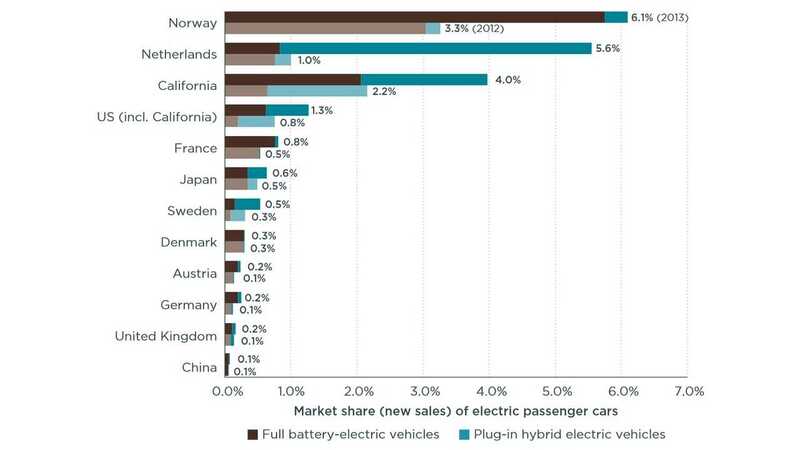 The flagship example for this are Norway and Netherlands, which are EV and PHEV lovers. 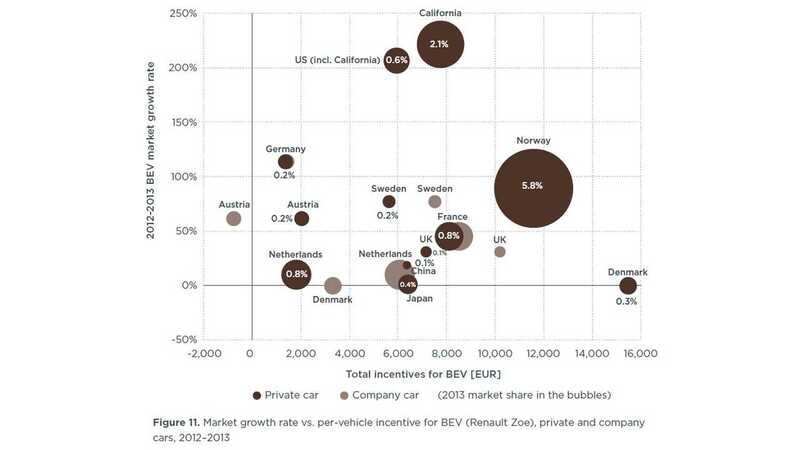 "For example, Norway’s fiscal incentive of about 11,500 EUR per BEV (equivalent to about 55% of vehicle base price) is associated with a 6% market share for BEV in 2013, and a 90% market share increase from 2012 to 2013. 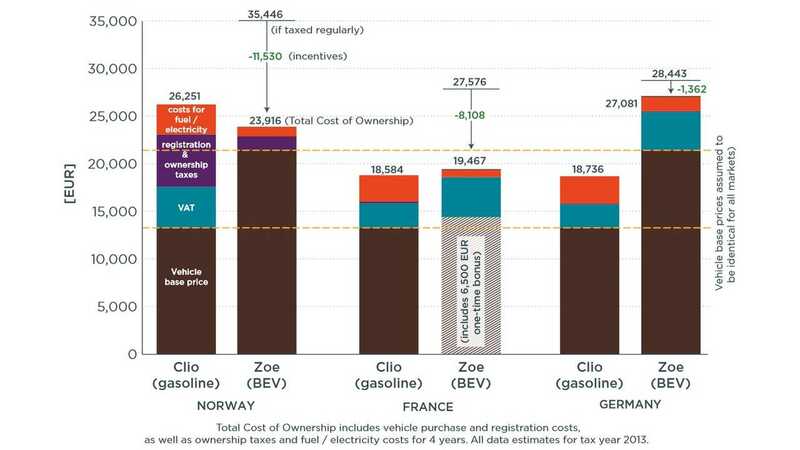 Similarly, the fiscal incentive in the Netherlands of about 38,000 EUR for PHEV (equivalent to about 75% of vehicle base price) in 2013 is associated with a 5% market share for PHEV in 2013, and a 1,900% market share increase from 2012 to 2013. These two examples indicate how national fiscal policy can offer a powerful mechanism to reduce the effective total cost of ownership and entice consumers to purchase electric vehicles." As we can see, differences in plug-in adoption are huge and the ICCT report is trying to answer where these differences comes from. "This report is the first to evaluate the response to fiscal incentives in 2013 to incentivize the purchase of plug-in electric vehicles in major vehicle markets around the world. It offers a synthesis of wide-ranging sales data, national taxation policy information, and direct electric vehicle purchasing rebates to analyze the link between government policy and electric vehicle sales. It does so by focusing on two representative vehicles, the Renault Zoe battery-electric vehicle (BEV) and the Volvo V60 plug-in hybrid electric vehicle (PHEV)." But it's not this simple everywhere. For example. in the UK, with its £5,000 plug-in vehicle purchase incentive, sales didn't take off in 2013. "The research findings indicate that fiscal incentives matter, but are clearly not the only factor that influences today’s electric vehicle market growth. 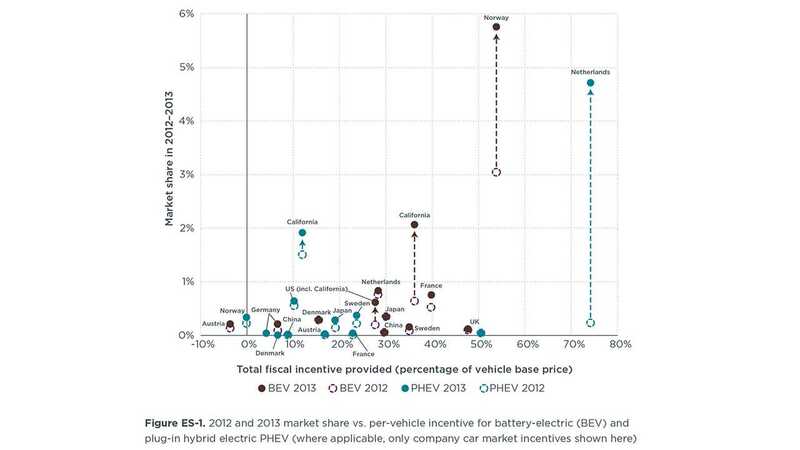 For example, despite a relatively high level of fiscal incentives, the current market share of EV in the United Kingdom (UK) was found to be low in comparison with other markets. Many confounding factors mean that a clear direct relationship remains elusive between national fiscal incentives and electric vehicles’ early market growth across each of the major vehicle markets—as seen in the spread of the data and the lack of an obvious trend line in Figure ES-1 above. This indicates both the limitation of fiscal policy and also the limited understanding of all the underlying factors and other policies that could help drive and sustain the electric vehicle marketplace." "As a result, a more comprehensive study is needed of the full portfolio of policy actions taken to accelerate the early electric vehicle market—and their impact on the effective total cost of ownership. Such a study would investigate the importance of vehicle manufacturer policy (emission standards, electric vehicle requirements), infrastructure (residential equipment, public charging), electric utility actions (time of use charging), and other local policy (reduced rates for toll roads, preferential parking), along with the consumer fiscal policy evaluated here. 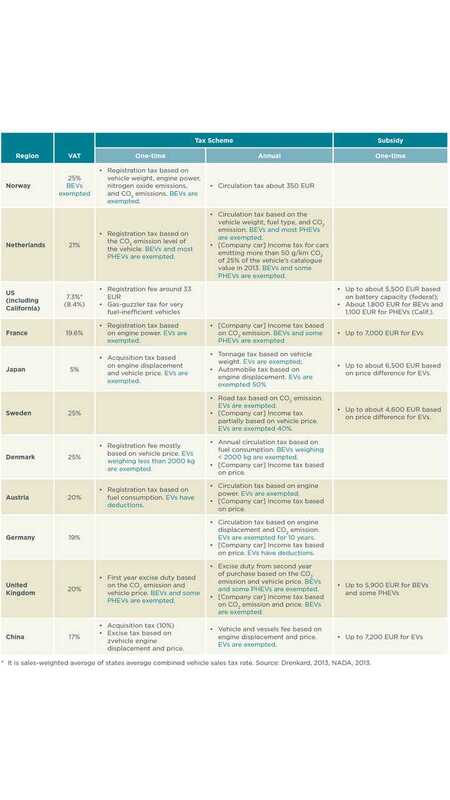 A more comprehensive and rigorous assessment would help inform the development of a longer-term policy path that is less dependent upon large initial-year taxation incentives." For more detailed results and analysis go direct to the report. Sidenote: We are happy to announce that one of the many reference sources for the ICCT report was an InsideEVs article penned by our very own Eric Loveday.